Once I got my new iPhone 7 Plus unboxed, I had a new case and a glass screen protector waiting. I like to keep my phones is nice condition in case I want to pass them on or resell them later. The Jet Black iPhone 7 Plus is a dust and finger print magnet, and the glossy black back supposedly scratches easily. 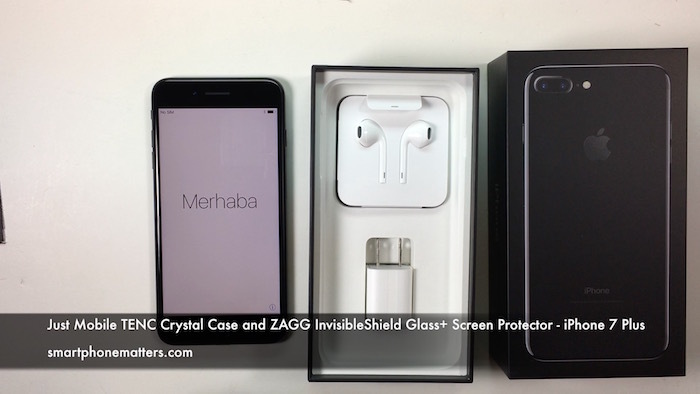 I chose the Just Mobile TENC Clear Case and the ZAGG Invisible Shield Glass+ screen protector. The TENC case supposedly has auto heal technology, which means the minor scratches on the plastic should not accumulate. I don’t know if this really works, but I like the idea of a plastic clear case that doesn’t get cloudly looking from scratches. I had a TENC case on my iPhone 6s and I liked it enough to try one on the 7 Plus. Turns out, the new case is different. It offers full body protection, and it has a glossy look. My previous TENC had more of a matte finish. Both cases are thin. The older one was so thin a number of people though I didn’t even have a case on my 6s. This new TENC has better coverage, but is more of a fingerprint magnet itself. The case is pretty easy to install and remove, just follow the included instructions.I’ll provide an update after I have a chance to use this for a while. I also installed a ZAGG Invisible Shield Glass+ screen protector. This time I ordered from a retailer, rather than Zagg as I wanted faster free shipping. They sent me a Glass Plus in a box labeled for the 6 Plus / 6s Plus. I did a quick search online and found some info saying the one for the 6s Plus is the same for the 7 Plus. These protectors aren’t cheap. I like the quality and their replacement service, which I seem to use for almost every one I buy. I do recommend looking for a discount code on these or when Zagg is running a deal. Note that I actually made the video below right after the unboxing, but didn’t get around to publishing during the holidays.